Let it never be said that Angelina Jolie and Brad Pitt ever do things the conventional way. After all, most couples get married, go on a honeymoon, have children together, and spend years of their lives together, usually in that order. Instead, Pitt and Jolie got married in secret with their six children already present and then spent their "working honeymoon" on the first film they'll be starring in together since Mr. & Mrs Smith, the film that brought them together to begin with. Now Entertainment Weekly has given us our first look at By the Sea starring Jolie and Pitt and it only serves to highlight what a bizarre choice for a honeymoon this actually is. Set in France during the mid-1970s, Jolie plays Vanessa, a former dancer, and Pitt is her husband Roland, an American writer. As they travel the country together, they seem to be growing apart, but when they linger in one quiet, seaside town they begin to draw close to some of its more vibrant inhabitants, such as a local bar/café-keeper (Niels Arestrup) and hotel owner (Richard Bohringer). Vanessa and Roland's marriage might be on the rocks, but they find a makeshift family in the other people and couples in the seaside town and the relationships they build with them change them and they way they look at each other along the way. Jolie chose the '70s for the fact that the simplicity of the era allowed for a focus on the characters' emotions, which form the basis of the character study that will be evident in By the Sea. No release date has been set for the film yet, but Jolie and Pitt are co-producing it together and there's really no doubt that it's going to be a hit. 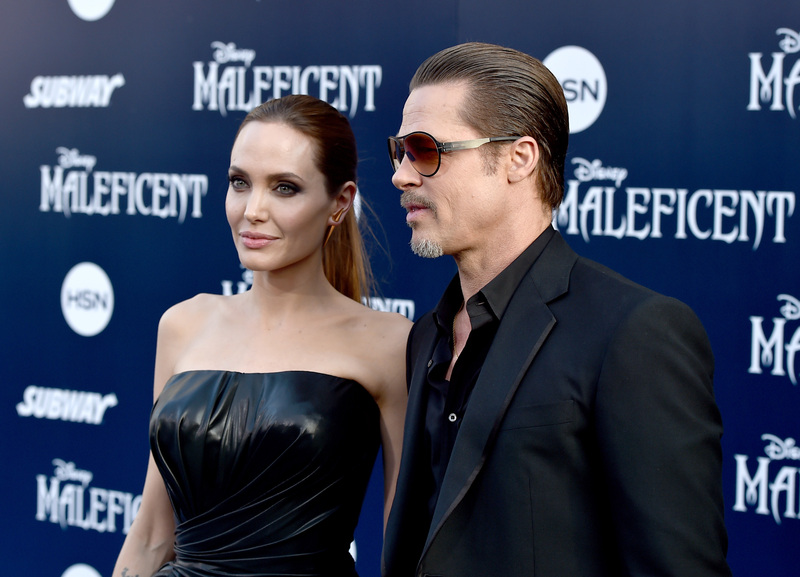 After all, as we learned from Mr. and Mrs. Smith, Jolie and Pitt are a huge box office draw. The thing is, it's important to remember that this is what Jolie and Pitt are doing for their honeymoon: playing the roles of a couple whose relationship is on the rocks. I repeat: Their first action as an officially married couple is to submerge themselves into the minds and emotions of characters who are growing apart. And considering how broken down Jolie looks in this EW image, that slow and subtle chasm between them hasn't been easy on them emotionally. Is it a bizarre choice? Maybe. Is it the kind of thing we should expect from Jolie and Pitt, who make entire careers out of forcing people to expect the unexpected? Definitely. Check out the picture below and more images can be found at Entertainment Weekly.